The parade, which commenced at Church and Utica Avenues in the heart of the Guyanese-American community in Brooklyn, was led by Committee Chairman, Mr. Rickford Burke, Guyanese American New York State Senator-Hon. Roxanne Persaud, Guyana’s Second Vice-President and Minister of National Security, Khemraj Ramjattan and Guyana’s Minister of Public Infrastructure, David Patterson. The Christian Fellowship Pathfinder Club Marching Band was the drum corps of the parade. 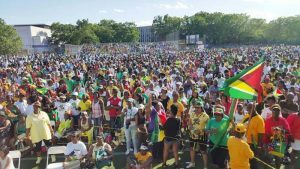 Thousands of proud Guyanese revelers danced and gyrated to Adrian Dutchin’s “Show Me Yuh Flag,” several other Jubilee songs by Guyanese artists and Soca music from around the Caribbean. The parade flowed up Church Avenue, south into to Ralph Avenue and ended at the South Shore High School Park at Glenwood and Ralph Avenues. Hundreds of NYPD officers lined the barricaded route as police officers on motorcycles and in marked vehicles steered through the Brooklyn streets lined with spectators waving Guyana flags. The parade reflected diversity and Guyanese unity. The Indo -Guyanese community in Queens led the parade with a float promoting Lakshmee Singh’s Radio and TV shows. The talk show host herself, flanked by several beauties and dancers, waved to the overjoyed crowd. Singh is organizer of the annual Diwali parade and cultural show in Richmond Hill, Queens. Another float, on a decorated giant 18-wheeler tractor trailer, blasted Soca music which electrified the massive crowd of thousands of Guyanese of all ages. The rear of the parade was a picturesque carnival scene with a sea of Guyana flags and revelers decked in colors of the flag. Passersby stopped and waved. Some joined the celebration, which also attracted many other West Indians. The after parade unity concert at South Shore attracted a massive turnout, causing the New York Police Department to mobilize additional personnel and close entrances. Hence thousands of persons, including Jubilee Celebration Committee members, could not gain entry. Patrons who were locked out of the park were however undaunted. They continued the festivities on the street which was blocked off by Police. Committee Chairman Rickford Burke said the Police measures were standard precautionary procedures and apologized to patrons who could not get in. He signaled that in the future consideration will be given to venues that can accommodate larger capacities. The Chairman noted that in spite of the glitches the concert went well and is one of the best in the New York Guyanese-American community. Burke also observed that NYPD reported that there was no incident and showered high praises on Guyanese community for being orderly and well behaved. ”For two consecutive years, thousands upon thousands of Guyanese turned celebrated significant occasions in our country’s history without incident. “This level of civility and orderliness is rare in New York City. This speaks to the peaceful nature, self-discipline and decency of the Guyanese people. I congratulate them. They’ve done our country proud. I’m confident that we’re earned greater respect and influence here in New York,” Burke said.